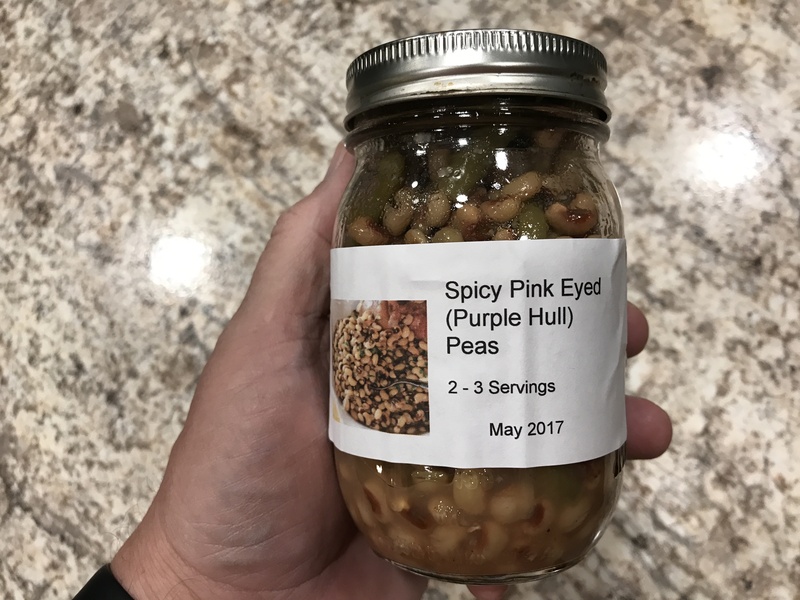 What is a Pink Eyed Pea? Very similar to a black eyed pea in look and texture but a different taste. The pink eyed pea has less of an earthy taste and more mild than a black eyed pea. They are so similar that you cook them the same way with the same spices but you end up with a slightly different taste. A great way to cook and preserve all types of food is pressure canning in 1/2 pint, pint and quart jars. For our family we prefer pint jars for our vegetables. The serving size of a pint jar is perfect for our size family of 3. We also buy our fresh vegetables in larger quantities so we are able to pressure can in lots of 15 – 20 pint jars. This allows us to put some into our daily food supply as well as our long-term food storage. Repeating this process allows us to build our long-term food storage. Pressure canned foods are part of our Heat and Eat meal plan. These are prepared meals that do not require and resources to make ready to eat. No cooking. No water needed. Just open the jar and serve. Heat the food is you wish. However, heating is not necessary as you can eat right from the jar. We even pressure can with our food already spiced. This also helps greatly as you do not have to store additional spices in your long-term storage. The more you can prepare now while you have resources makes for easier living during an emergency or disaster. Use this philosophy when creating your long-term food storage and you will enjoy better meals daily and when a disaster or emergency happens.